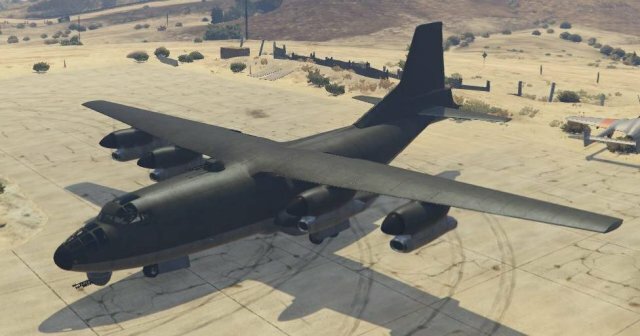 A detailed guide about what each armed aircraft in the game can do. How to Make Easy Money Everyday (Solo Guide). 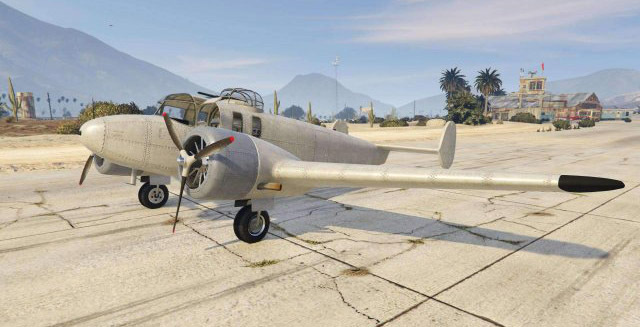 This GTA 5 guide was made due to the lack of a single place to find the stats and abilities of every aircraft in the game as well as a general lack of explanation for what each aircraft is actually good for. Much of the hard and soft data found in this guide was not determined by me, but rather largely by the Youtubers GhillieMaster, Pyrerealm gaming, and Broughy1322. This guide is ultimately just the short and sweet version of their aircraft review and testing videos, so if you'd like to know more please check them out. Durability is described in a slightly strange way: "#/#, Durability"- The first number is how many RPGs and strong explosives (i.e. all on-foot explosives except the homing launcher) it takes to blow up, the second number is the amount of Homing Missiles it takes, and then the relative resistance to bullets and impacts is described. 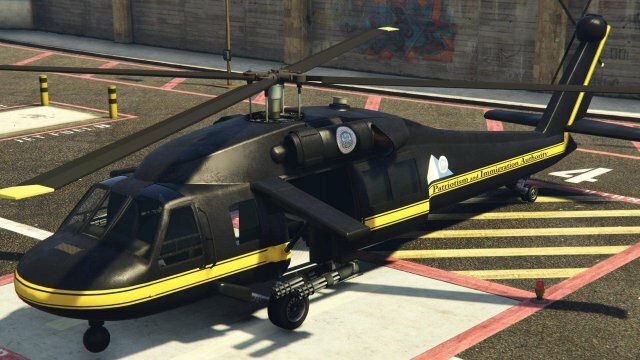 Notes: The workhorse helicopter of GTA. 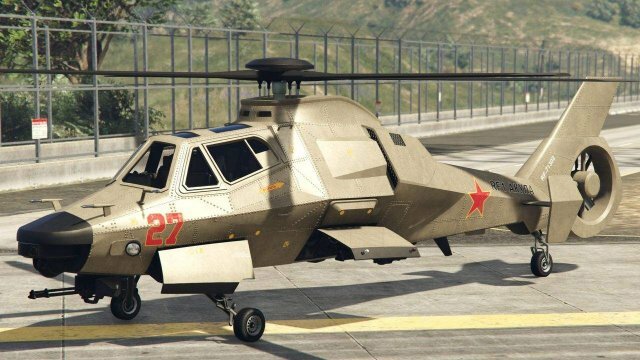 Relatively cheap, well-armed, and maneuverable, this helicopter's major benefit is how easily it can be summoned to you as a CEO or MC Road Captain. 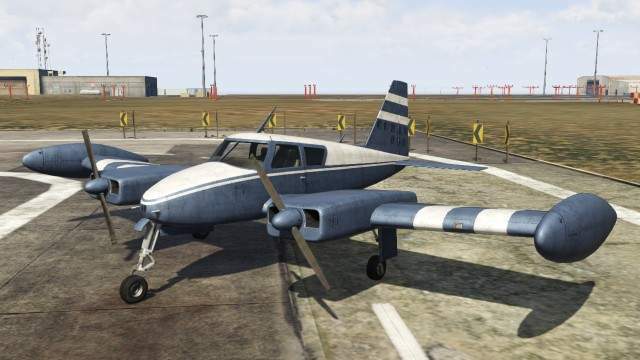 It will appear very close to you, just like a regular vehicle called via the mechanic or special vehicle request menu. It is, however, very fragile and the occupants relatively exposed to gunfire. Notes: A bit better than the Buzzard in most relevant ways except for player capacity and the lack of quick-spawn. You can only have one of the helicopter's 2 weapons equipped at once and the Rockets are a much better choice. Another helicopter able to be spawned from the CEO and MC menu, it is faster than the Buzzard but very poorly armed, unable to transport any associates, and difficult to land correctly. 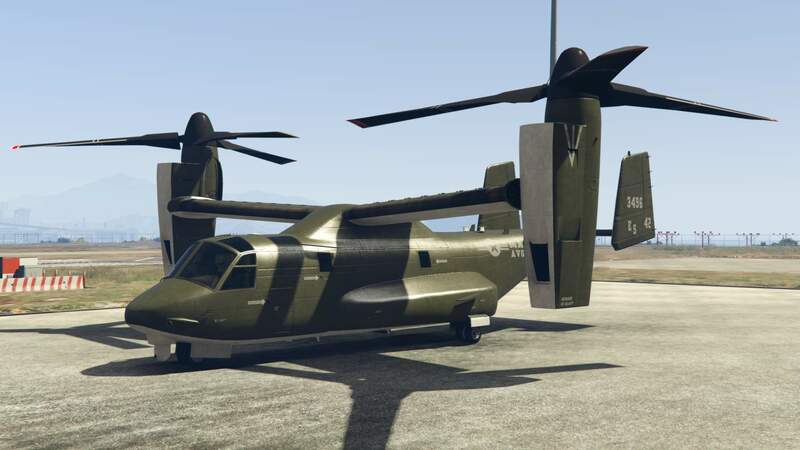 The personal vehicle version can be customized for increased durability and speed, a weak fixed minigun and countermeasures, but the quick-spawned versions do not retain these mods and are not armed. Notes: A rather slow, weak, underarmed, and overweight attack helicopter. 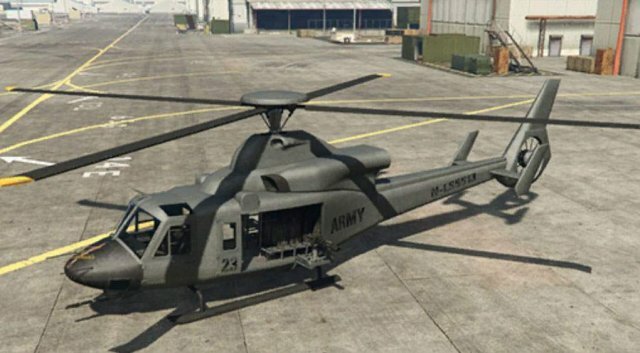 A shadow of its former self from GTA IV's episodes, where it possessed explosive guns, this helicopter is essentially a vanity item. 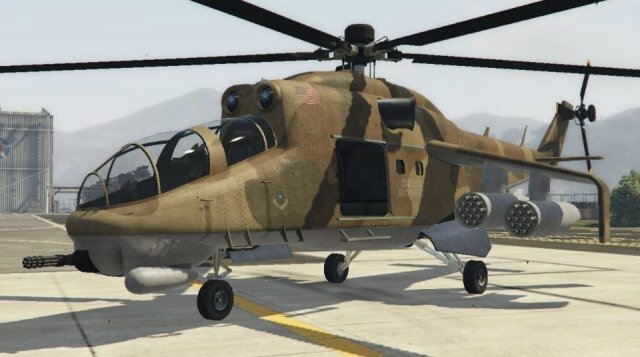 It can, however, be found in freemode as an airfield spawn, making it the only other armed helicopter than can be found (the other being the Buzzard). Notes: The king of ground attack, this helicopter has an incredibly devastating explosive minigun that can nearly instantly take out any air vehicle and quite quickly kill even the tougher ground targets, assuming you can get into the gun's rather limited range. Homing Rockets are also confused by this helicopter and lock on to the air underneath it, meaning they will prefer to fly under it and miss. However, it's a little on the clumsy side and its giant rotor makes for more than a few collisions. 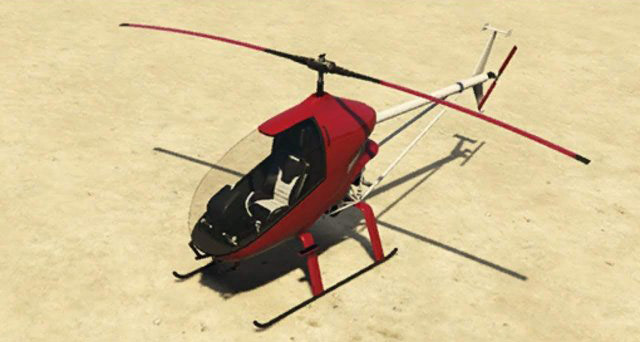 Notes: Fragile, and essentially unarmed when used solo, this helicopter is not entirely useless but is entirely outclassed by other helicopters, especially at its price point. Great for triggering Vietnam flashbacks. 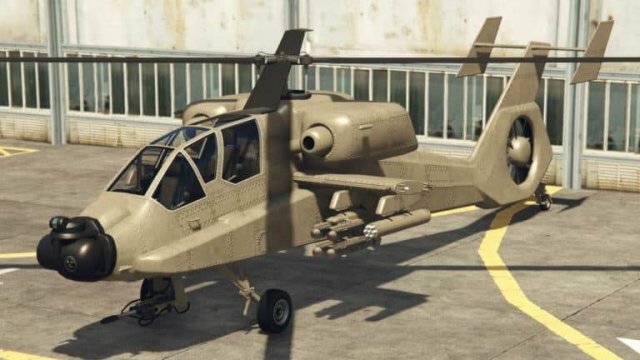 Notes: The attack helicopter. This thing possesses pretty much every type of weapon available, is quite fast and decently durable. It's quite expensive and one of its more powerful weapons requires a copilot to operate, but even solo it's still very threatening. Notes: This helicopter can activate a stealth mode in order to go off the radar for free. 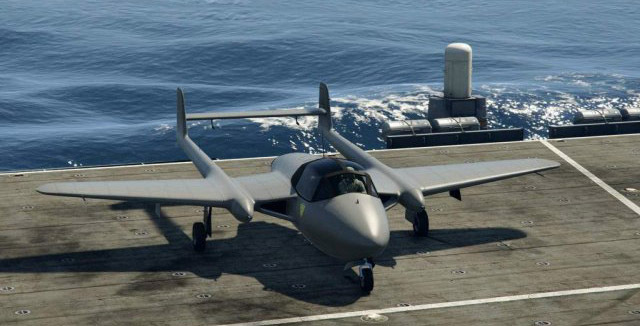 This makes it an ideal vehicle to run product, supplies, and cargo with, as the stealth extends to all goods' global signal. It's quite fast, durable, has a good capacity for players (rear passengers can also utilize cameras equipped with thermal and night vision). No slouch in combat, either. In general, an extremely competent aircraft. Notes: The generalist jack-of-all-trades plane. Pretty cheap, but surprisingly effective for what it is. Can do pretty much everything another plane can do, usually not as well but that's what you get for 1.2 million. Actually the second fastest plane in the game, despite being "just" a turboprop. Notes: Despite its resemblance to a desk fan, this plane is pretty good. Its major claim to fame is the fact that you can slam this thing into the water at any speed and angle you like and survive, as long as the plane doesn't turn upside-down underwater. 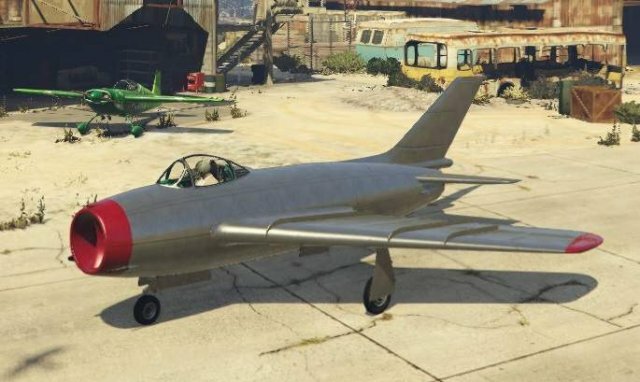 Notes: This WW2 fighter isn't the greatest plane for either dogfighting or ground attack, but it's not as bad as you would think, and it's stylish as hell. It also possesses a secret weapon: when you deploy the landing gear, the flaps are set, which grants you an unusually high reduction in airspeed without stalling the plane. 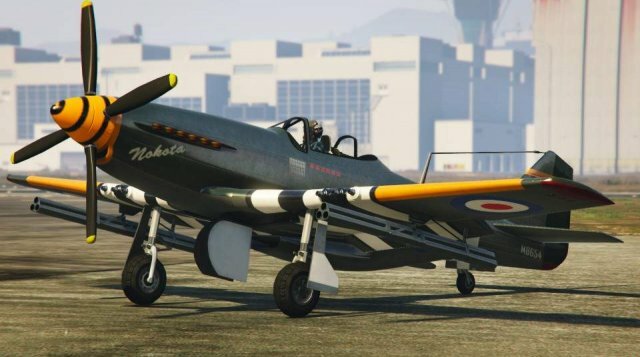 This can be used to prolong strafing runs and fire additional rockets. Notes: A really weird one. 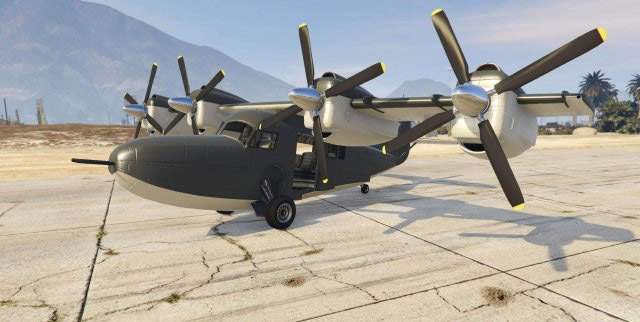 This is a 4-engine, WW2-era, VTOL amphibious bomber plane. Not the most effective at much of anything, and the rear gun is both ugly and largely useless, but it can land anywhere and take off just as easily due to the ability to equip JATO rockets. Notes: An old WW2-style bomber. Not fast, or agile, or durable, and its firepower is lackluster, but it's quite stylish and can equip JATO for quick takeoffs. Notes: Basically an overweight kite with an anemic engine. 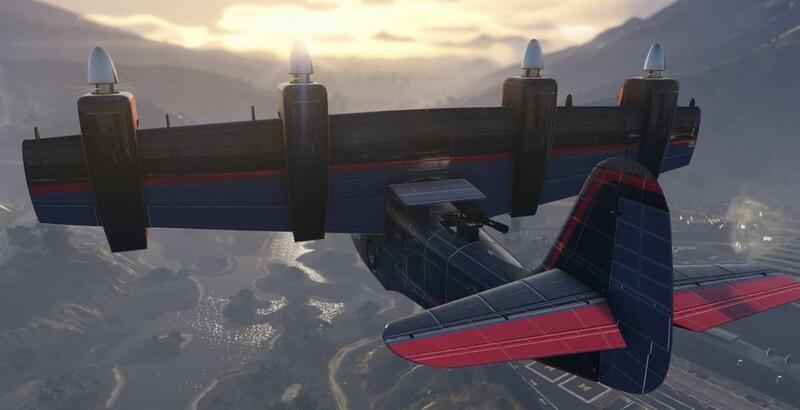 However, its Carbon Muffled Propeller upgrade gives it the ability to go off-the-radar when at low throttle speeds, and its aimable machine gun means you could do pretty well to glide in and kill a target before they have any idea what's going on. 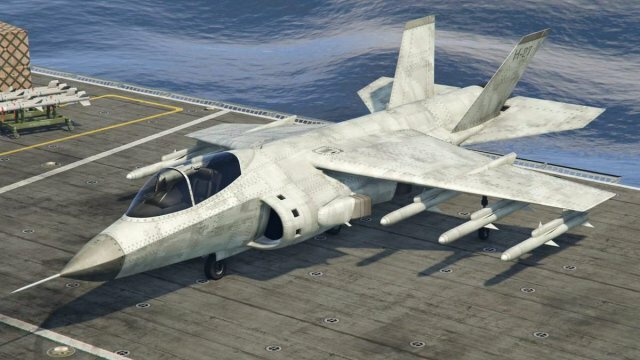 Notes: You can barely consider this thing an armed aircraft. This thing is pretty slow, quite fragile, and can only use bombs. On the other hand, not many people are expecting you to use this thing to come in and drop bombs on you, it has countermeasures, and it's free with the purchase of a hangar. Notes: The OG Jet. You shouldn't buy it unless you have unlimited cash, because it's free to steal it from the military base. You'll get 4 stars, but if you own a hangar at the fort, you only get 2 and can avoid even that if you do it without being seen. 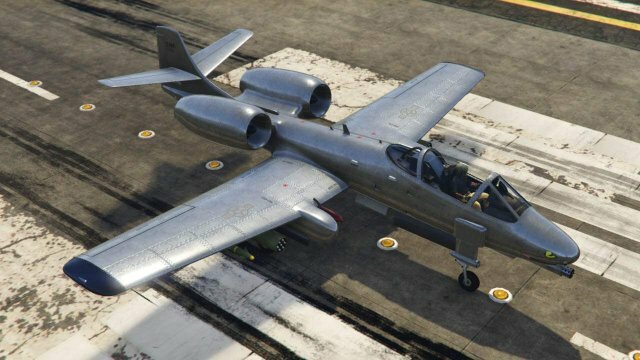 It's a very good aircraft, and can do both dogfighting and ground attack, but isn't quite as good as other more specialized vehicles these days. 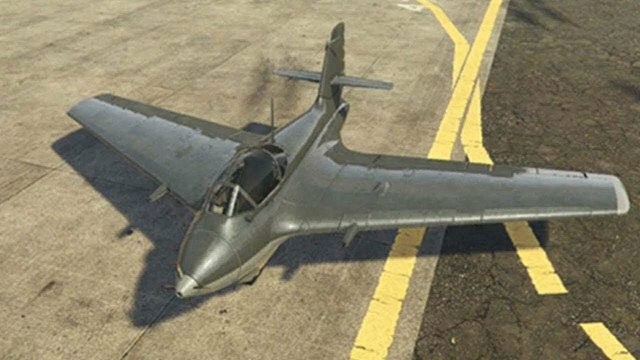 Notes: The best ground attack plane in the game. This plane's explosive guns are an absolute meme-beam of total destruction and can annihilate any armored vehicle in as little as one pass. It's not the best dogfighter, but if you can manage to get the other guy in your crosshairs he's dead already. Has a VTOL mode, and accordingly spawns on helicopter spawns instead of plane spawns when using Pegasus (but not via the hangar vehicle spawns). Notes: The premier dogfighter. Its machine guns are no good against ground targets but you can absolutely roast other air vehicles with ease. 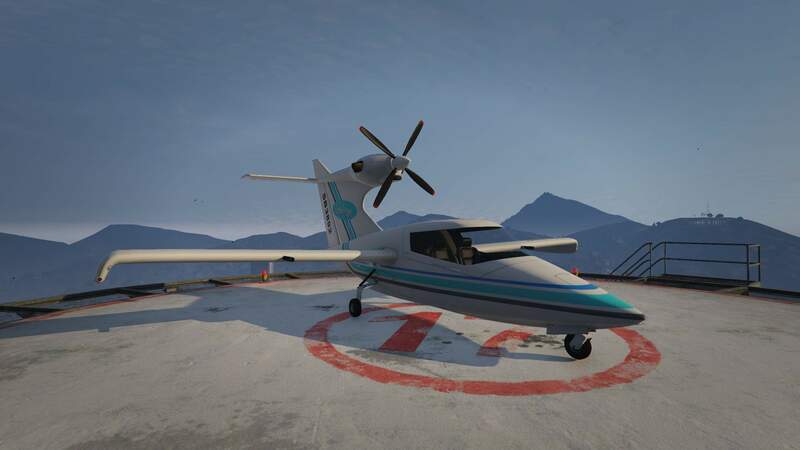 It's the fastest and most maneuverable plane in the game. Notes: It's got a meme-beam, alright, but not in a good way. Other than the complete joke of an explosive gun, this is an extremely competent aircraft. 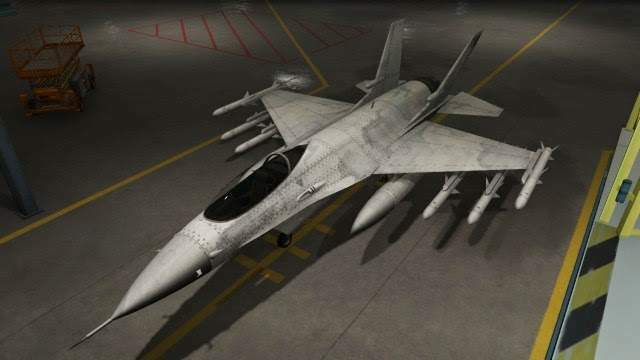 It's got the highest explosive resistance of any jet and has every weapon in the game. Very maneuverable, but not very fast. It's ridiculously bullet resistant and killing the aircraft with gunfire is incredibly difficult, as it has special armor properties that keep it alive unless both the left and right sides are damaged. Notes: An overpriced vanity plane, it's got at least one trick up its sleeve: very effective air brakes. It's capable of using the brakes for longer than other planes without shutting the engine down, and its braking is better than any other plane. This gives it unparalleled landing capabilities, but it's mostly useful for showing off as it lacks the JATO, VTOL, or speed to take off from ridiculous places like other planes can. Notes: A weird one. It's a glider that has a regenerating supply of rocket boost. With the boost engaged it's the fastest plane in the game. Without, it's the slowest. 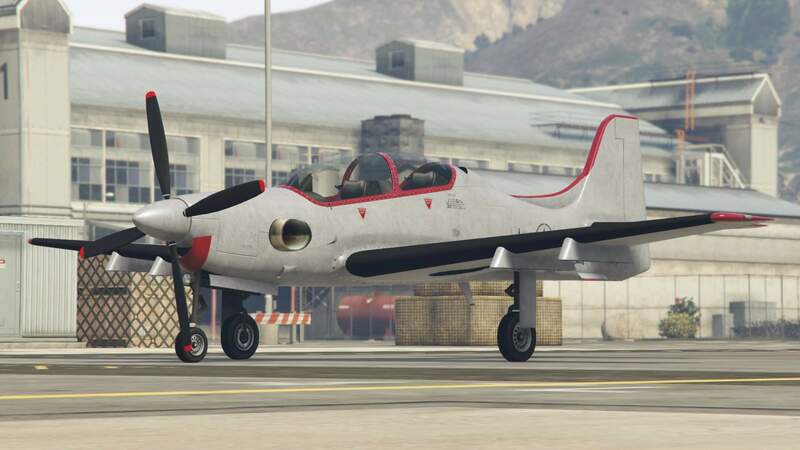 Incredibly maneuverable and capable of out-flying any aircraft in the game, but it's very difficult to master. Can be a competent bomber as well. Notes: The ultimate screw-around bomber plane. Incredibly slow, quite vulnerable, and a large target, but its 2 explosive turrets can rain down fire on anything they can see very effectively. Notes: Much faster than the Bombuska, and has more bombs, but much weaker in the turret department and lacks JATO. Not much else to say. 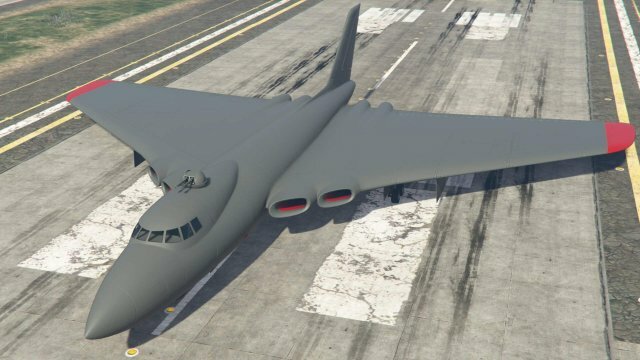 Notes: The infamous Air MOC, this is easily the most durable air vehicle in the game. In terms of performance it's not too bad, but what it's really here for is to provide mobile services to you, such as mark 2 weapon and weaponized vehicle modification, clothing swaps and weapon loadout changing. Appropriately upgraded, it can carry a weaponized vehicle and deploy it in midair. Autopilot can be used that will cause the aircraft to hover in place and not fall out of the sky when the pilot bails or enters the interior.